Jewish Federation of Cleveland: Young Families: Meet Aviva! 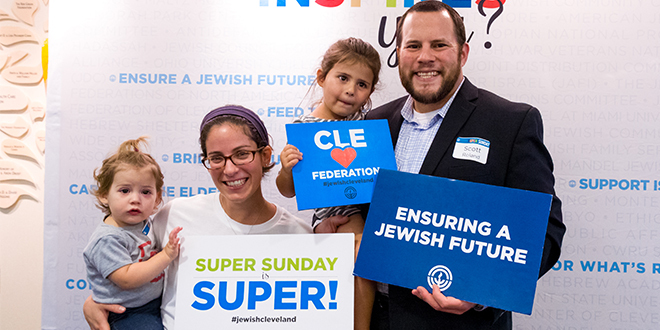 Aviva Roland, Federation's new Manager of Young Family Engagement, shows some Jewish Cleveland pride with her family at Super Sunday. Q – Tell us about yourself. A: I am the new Young Family Engagement Manager at the Jewish Federation of Cleveland. I am a mom of two amazing daughters. We have lived a few places, including Israel and I’m excited to now be in Cleveland. I’m looking forward to connecting with other young Jewish Cleveland families! Q – Why do you love the PJ Library program? A: Our PJ Library program lights a Jewish spark for young families. Each month, children across our Cleveland community receive free PJ Library books, building their Jewish libraries. Parents share wonderful snuggly moments with their children, reading the books before bedtime. Those moments become sparks of Jewishness. Q – Who can receive free PJ books? A: PJ Library is for children 6 months to 8 years old. There is also something called PJ Our Way, a new program geared for children 9 to 11 years old. The younger children get surprise books mailed to them but the older children choose their own books online and have them mailed – like shopping. All books come addressed to the child. It’s such a treat to see a PJ package in the mailbox each month. Best part, it’s totally free! Q – Do PJ families get the chance to meet each other? A: Yes! We do lots of activities in the community – about one event per month. There’s something for everyone. Our PJ Library Engagement Ambassadors are young Jewish Cleveland parents who meet with families one on one and also set up events for families to get together and socialize. Right now we have Ambassadors focused on connecting families with children who are 0-2 years old and a Russian-speaking Ambassador focused on connecting Russian families. And, we are currently looking for two new Ambassadors to connect families in the Twinsburg, Solon, Chagrin Falls and surrounding areas. It’s great for new parents, new to town parents, or young families who want to meet other young Jewish and interfaith families like them. Q – Do you have a favorite Jewish-themed activity young families can do together? A: My personal favorite is making challah with my children. It’s something you can do with your hands, something we can all do together. It’s something that is yummy, and something that is Jewish. It’s a nice way to go into Shabbat and start the weekend. Share PJ Library books about Shabbat and making challah with your children. Invite another family over to do it with you too! You’ll feel connected to other Jewish families, connected to Shabbat, connected to PJ Library, and connected to the Jewish Federation of Cleveland. That’s a lot of connections – how fun! You can find out more information on PJ Library and young family engagement by contacting Aviva Roland at 216-593-2926 or aroland@jcfcleve.org.